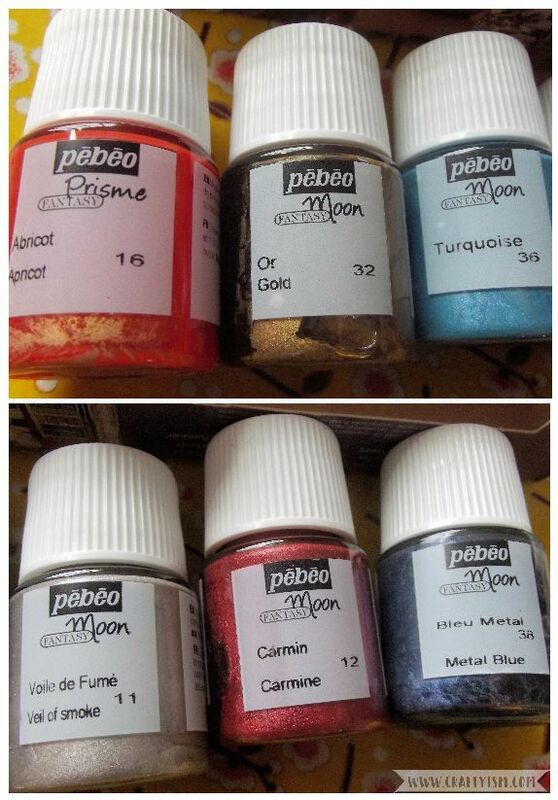 If you’re interested in the Pebeo Fantasy Moon Paints, keep reading for my first impression review. Sometimes it’s easy to get stuck in a crafty rut, using the same products to do the same crafts over and over again. I decided to mix things up a bit and try out the Pebeo Fantasy Moon paints. Best of all I managed to get the Pebeo Fantasy Moon Discovery Set in the sale at Hobbycraft! In the Discovery Set you get six 20ml pots of paint in the colours Apricot, Gold, Turquoise, Veil of Smoke, Carmine and Metal Blue. The paints need to be mixed well before use. I used wooden cocktail sticks to give them a good stir. What’s so special about these paints? The idea with Pebeo Fantasy Moon paints, is that they create amazing enamelled, hammered looks with a metallic finish. If you imagine coloured enamel jewellery, that’s the effect you can supposedly create with these paints. It’s claimed that they can be used on any surface, so I’ve collected a range of items to try them out on. Before trying the paints for the first time, I watched a few video tutorials. Most people seemed to be pouring the paints and using them to fill up spaces. 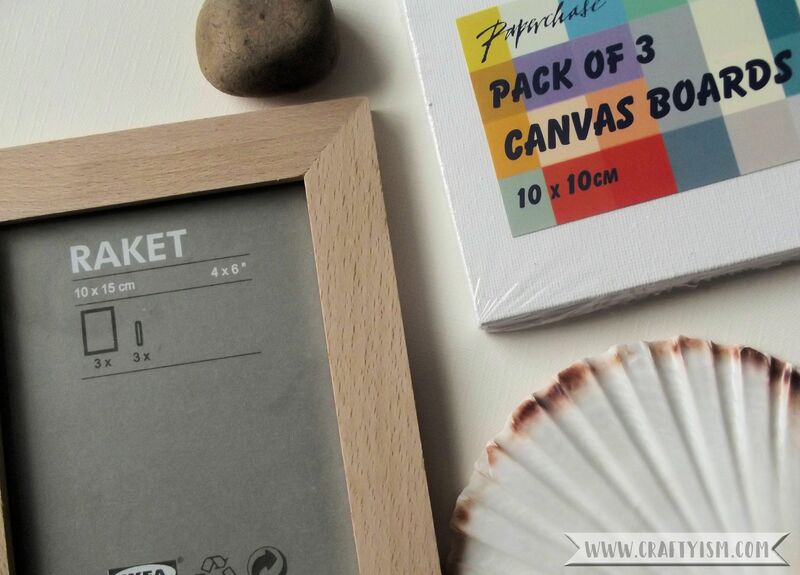 For example, using them to add colour to blank jewellery cabochons, or in special canvas frames. I decided to use a blank Ikea frame and pour the paint directly onto the glass. I decided to pour the colours randomly, thinking they would blend together on their own. However I was surprised at how thick the paint is, and once it is on the surface it doesn’t spread much. I used a cocktail stick to mix the colours a little, and tipped the frame at an angle to help it spread to the edges. 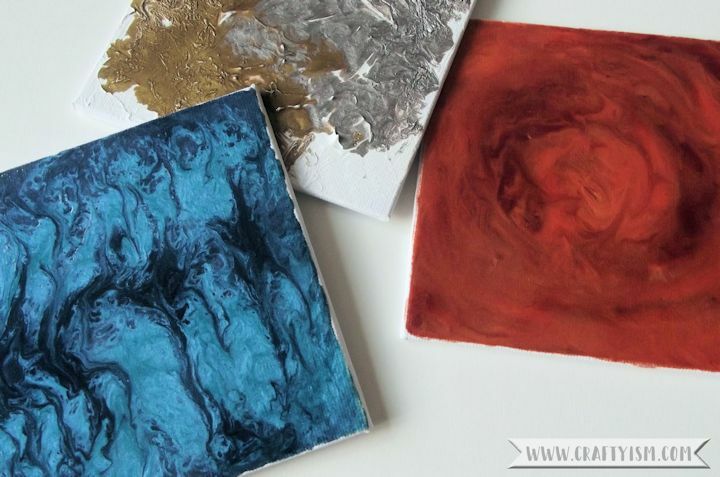 I wanted to see how the paints reacted on a canvas, and as I had a pack of three mini canvases, I decided to try a different application method on each. Using Turquoise and Metal Blue, I poured them in alternate lines. Then using a cocktail stick, I dragged lines through the colours to blend them. This pattern reminds me of marbled papers in old books. 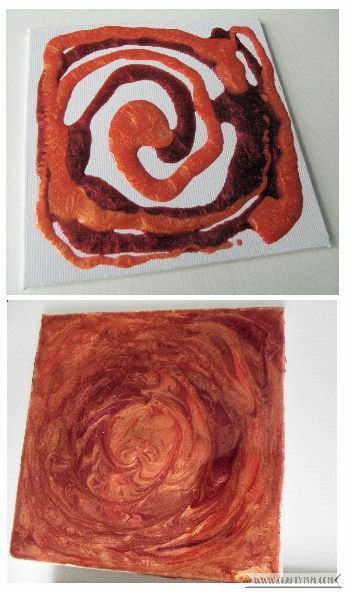 With Apricot and Carmine, I poured out a spiral. 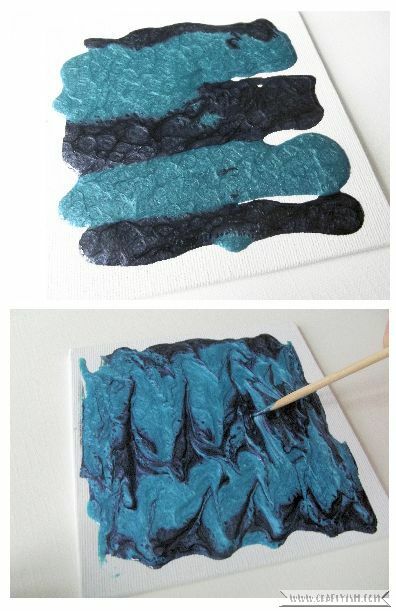 Then again, using a cocktail stick, I swirled and blended the colours together until they reached the edge of the canvas. This reminds me of dragon fire! On the last canvas, I applied a thick layer of acrylic Gesso. Whilst this was still wet, I poured on Veil of Smoke and Gold, again swirling all together with a cocktail stick. As it is claimed that these paints can work on any surface, I decided to use them to decorate a stone! 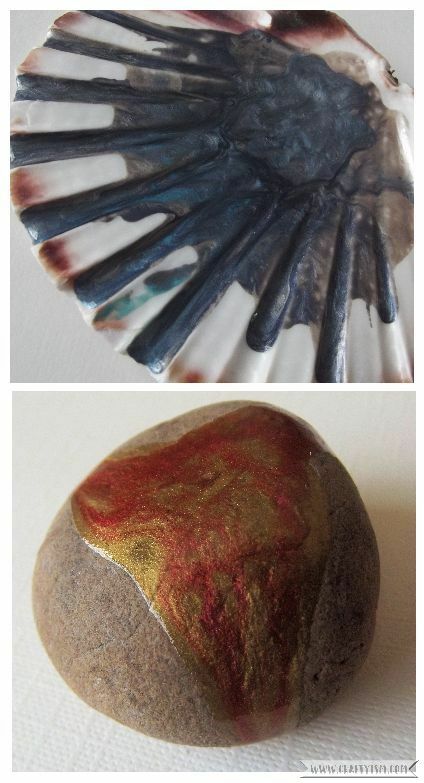 I used Gold and Carmine and simply poured them onto the stone, letting the colours choose their own path. Finally I poured Veil of Smoke, Turquoise and Blue Metal into a large shell and swirled them around with a cocktail stick. 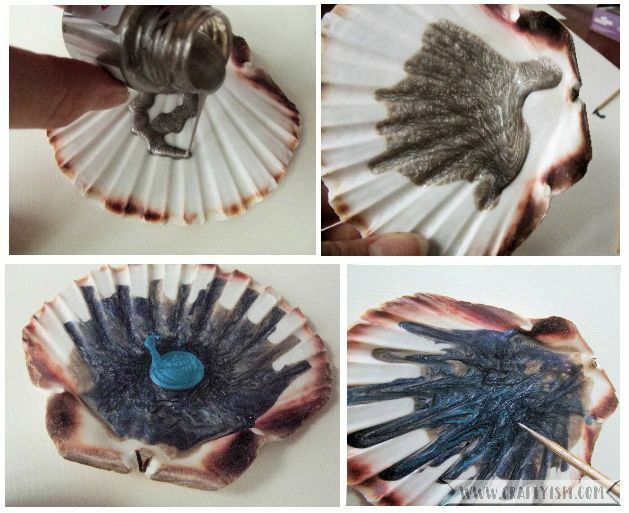 I thought the mix of sea colours would make it look like the shell was by the beach! The pack says that the paint is touch dry within two hours, then fully dry within ten hours. However, after 24 hours, the paint on all of my surfaces was still slightly tacky. This could be because I poured the paint, if I had used a paintbrush, the paint would be thinner and might have dried quicker. The finished frame looks really beautiful. The colours have blended and layered up in such interesting and abstract patterns that I never would have been able to achieve with any other paints. I was a bit disappointed that there wasn’t much of the hammered effect that some of the paints were supposed to have, but again perhaps the paint was too thick. The finished canvases were a mix of results. I love the blue canvas, the colours have combined so well and there is a little of the hammered effect on the edges where the paint is thinner. It has also dried so smooth and glossy that it looks a bit like blue marble! The red canvas has also dried to a super smooth finish. However, the colours have blended together a bit too much and you can’t see the swirls as clearly. 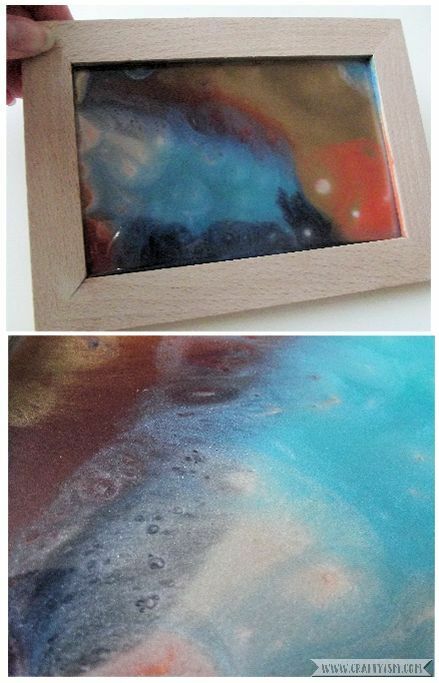 Using the Pebeo Fantasy Moon paints on these small canvases would be a great way to make faux marble coasters. You could even match them to your décor. I am not so pleased with the canvas that was prepared with Gesso first. Although it looks ok, there are no special effects from the paints. I could have just used regular silver and gold paints and got the same look. Finally the finished shell and stone. I think the shell doesn’t look great as the paint was too thick and the colours have become muddy. As for the stone although none of the paint’s special effects have come through, I like the finished look. If I did this to a lot of stones with different colours and displayed them in a jar, it would look really good. 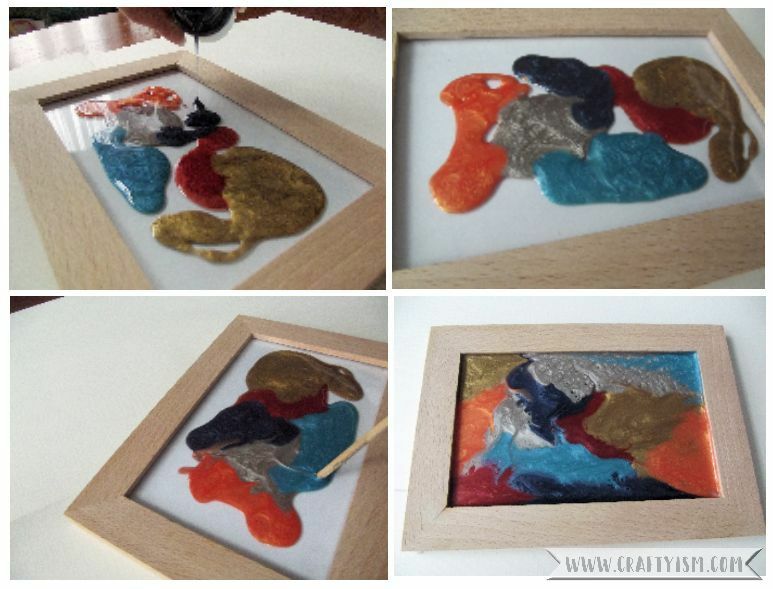 I would recommend Pebeo Fantasy Moon paints if you are looking to create colourful abstract projects. This is a medium that you don’t have much control over so you have to be prepared to experiment. If you are looking to add colour to metal work and jewellery projects, you should definitely give these paints a try. The smooth glossy finish is amazing and when it appears, the hammered paint effect looks great and just like enamel work. Use them in a well ventilated room as they smell really, really strong. The paints are oil based so you will need to use white spirit to clean any brushes or tools. Make sure to have a flat surface where your projects can dry undisturbed for at least 24 hours. Don’t be afraid to play around with the paints and try new techniques! If you have used Pebeo Fantasy Moon paints before, let me know your top tips. I’m sure these paints can do much more than I’ve shown here!